German physician and traveler; born at Emrich, near Cleves, between 1770 and 1780; graduated at Frankfort-on-the-Oder in 1800. From 1804 to 1816 he lived in England; he then settled in Hamburg, and in 1838 returned to England. After amassing considerable wealth in Brazil he returned to Europe, and took up his residence in Altona. He was a contributor to Hufeland's "Journal of Practical Medicine," and published "The Continental Medical Repository" (Hamburg, 1817). 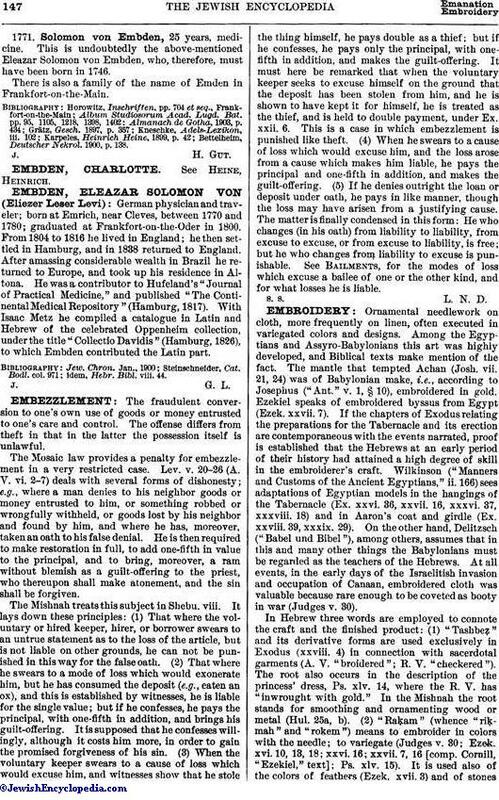 With Isaac Metz he compiled a catalogue in Latin and Hebrew of the celebrated Oppenheim collection, under the title "Collectio Davidis" (Hamburg, 1826), to which Embden contributed the Latin part. idem, Hebr. Bibl. viii. 44.